Taking a fall beach vacation has many perks. The beaches aren’t as crowded, the days aren’t as hot, and the colors on Hilton Head Island are stunning when the leaves start to change. There’s one massive benefit you may not have considered if you’re planning to visit Hilton Head Island in the fall: haunted attractions! Hilton Head Island and the surrounding areas have exciting historic significance, which means a few ghosts are sure to be around every corner. What better time to visit these haunted locations than Halloween? If you’re on your way to Hilton Head this fall, make some plans to visit some of our incredible historic (haunted) sites. Hilton Head Island’s own ghost, the Blue Lady, takes up residence in Harbour Town. Caroline Fripp was the daughter of the lighthouse keeper, who died at the top of the lighthouse during a raging hurricane—or so the story goes. After completing her father’s task to keep the light burning during the storm, the girl then passed away herself. Her ghost now haunts the buildings that were located at the base of her lighthouse, which were moved from their original location in Leamington to the current Harbour Town. She’s in residence all the time, according to the locals, but you just might have a better chance of seeing her during the Halloween season. The Joseph Johnson House, or The Castle, is a short drive from Hilton Head but worth the trip. The house, built in 1850 in the Italian Renaissance style, is rumored to be haunted by a dwarf named Gauche, who was brought to the area by French explorer Jean Ribeaut in 1562. Even if you don’t get to meet that particular ghost, there are chances to see others, since the house was used as a hospital during the Civil War. You might recognize Bonaventure Cemetery as the location of the Bird Girl statue from Midnight in the Garden of Good and Evil. Though the statue is no longer located in the cemetery, many other significant structures are, such as the statue of Gracie Watkins. Gracie receives trinkets from visitors of money or flowers, and is said to cry tears of blood if those gifts are removed. She’s just one of many haunts in the cemetery, so make the drive to Savannah during your Hilton Head vacation if you have the time. In fact, Savannah is home to several other haunted spots, including the East Bay Inn, Hampton Lillibridge House, Olde Harbour Inn, The Pirate’s House, and the Lucas Theatre. For thrills and chills, Savannah is hard to beat. 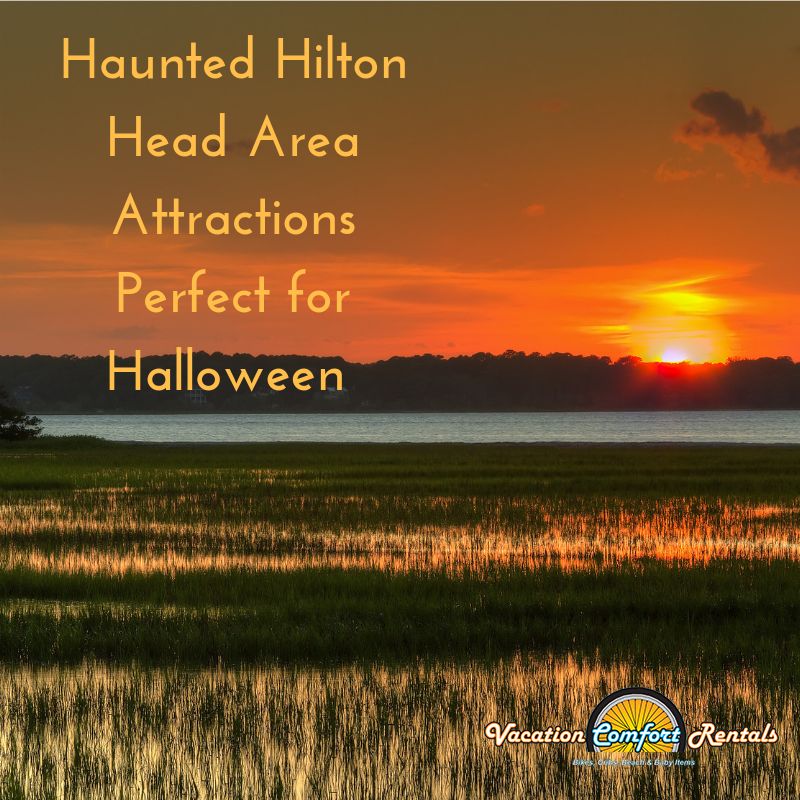 With the various plantation homes, lighthouses, cemeteries, and other places of interest near Hilton Head, you’re sure to see your fair share of spooky sights. Don’t forget to rent a bicycle so you can experience the crisp fall breezes as you visit with our island history. We can help you reserve your bike now, as well as many other things you might need to make your fall vacation on Hilton Head comfy. We’ll see you soon!